Lamina trullate, trifoliolate, 30-180 x 20-200 mm, pinnae irregularly pinnately lobed to incised, hirsute with short stiff adpressed hairs, interspersed with very short glandular hairs. 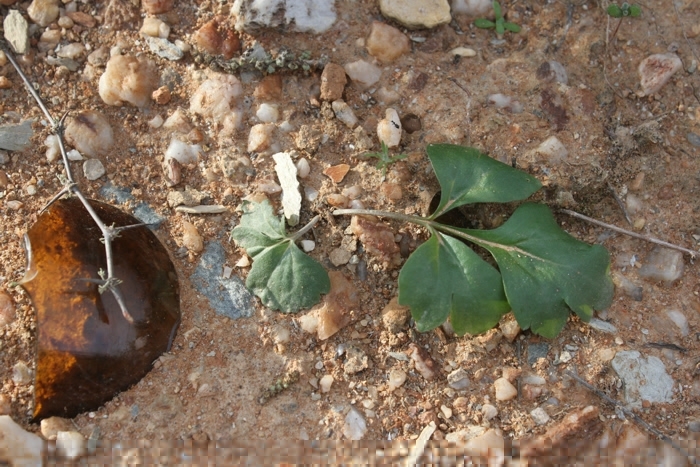 Stipules subulate, adnate to petioles with free apices, 10-15 mm. 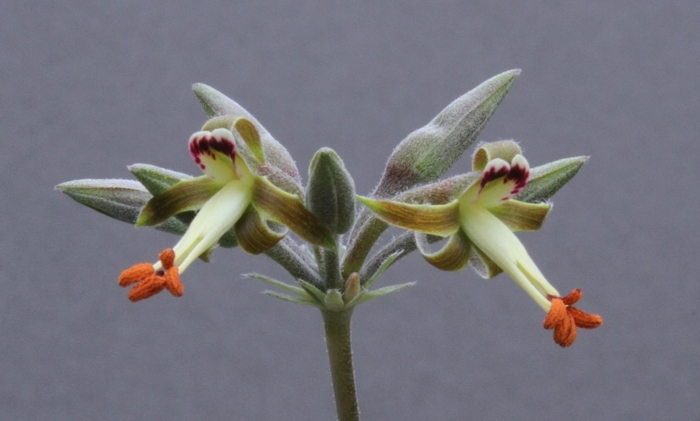 Branched, with 2-10 pseudo umbels, each with 3-14 flowers. Peduncle 35-160 cm, densely hirsute with short stiff adpressed hairs, interspersed with short glandular hairs, pedicel ~0.5 mm. 5, lanceolate, recurved during anthesis, 5.5-9 x 2-4 mm. Hypanthium 7-14 mm. 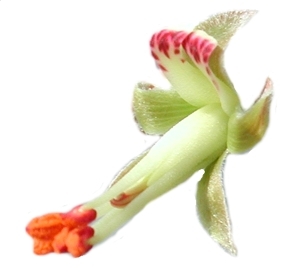 2, in posterior position (seldom more), white with feather-like markings, ligulate to spathulate, 4.5-6 x 1.2-1.8 mm. 5, all of almost the same length, pollen orange. 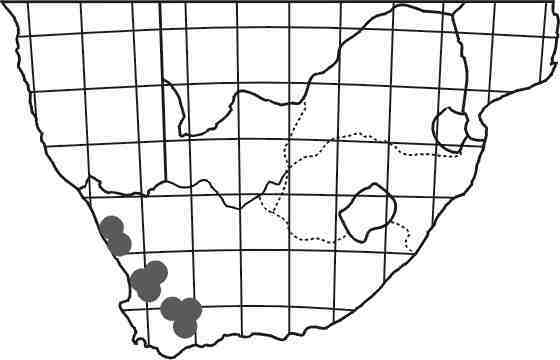 The quartz fields of Knersvlakte, 35 km N of Vanrhynsdorp, W Cape Province. 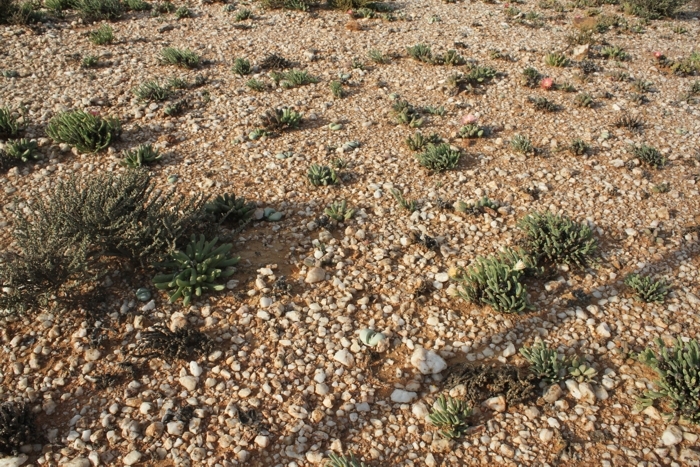 Far from being a desert, the ground can get very wet in winter and does not release moisture easily. Like a mirage, the landscape often shimmers in sunlight, but its true wonders are close to the ground. One is easily humbed by nature in more ways than one, as plant-spotting here requires frequent kneeling down. 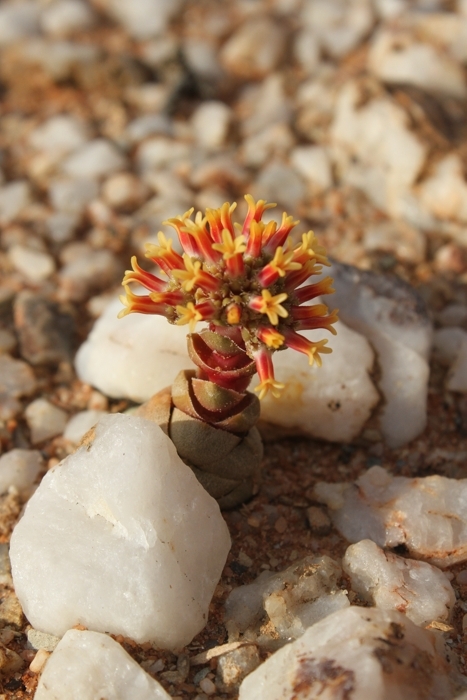 Here, Crassula columnaris dons its festive wig. 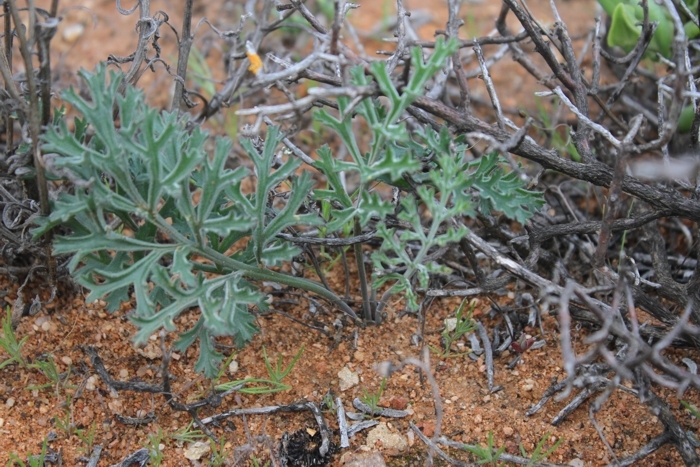 A younger plant resiliently growing in the roadside litter along N7, 35 km N of Vanrhynsdorp, W Cape Province. 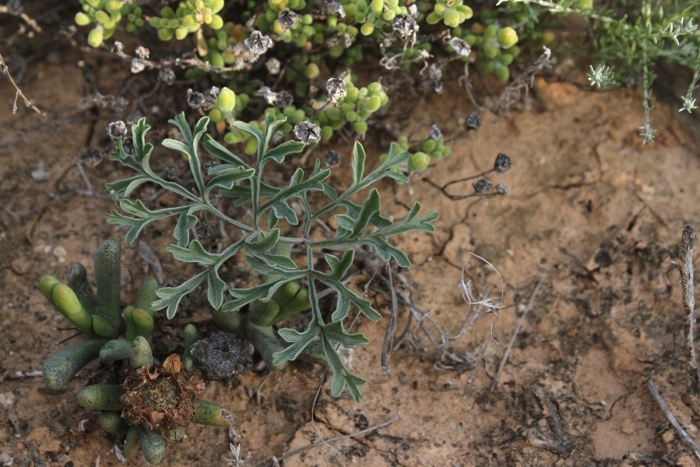 Young plant of probably P. carnosum, quite easily confused with adult plants of P. leipoldtii, its numerous leaves being the give-away. P. leipoldtii usually has a single leaf. Thissite and all subpages were created and aremaintainedby MatijaStrlic. All photos©Matija Strlic unlessotherwise indicated, 2000-2014. Thiswork islicensed under a CreativeCommons Attribution-NonCommercial-ShareAlike 4.0 International License.